Information Architecture (IA) is all about organising information, planning a routing system and implementing content in a structure that's comprehensible, and searchable. It is great to have lots of information at your disposal but not knowing how to arrange them to fall into place can be detrimental. With the use of information architecture, you can organise your website’s contents in such a way that an interface is created to support each category. This makes web usability at its optimal. Information Architecture also includes many parts of a good application’s general conceptual design, like the framework for how users comprehend tasks, workflow, and the house- keeping of content or data. One important aspect of information architecture is classification. Classification creates impart to the cutting edge for data retrieval. You have to structure the content in such a way that the user finds important information quickly and not struggle to find what they are looking for within 3 clicks. If you have quite a large website, then it is always handy to have a dedicated sitemap page to list all the content of your website in a hierarchical manner, the sitemap makes it easy for users to access information effectively. Also making use of breadcrumb trail is another way to show the users where they are located in relation to your website, particularly if your website has deep routed pages. This is sufficient to aid the user in navigating your website and improves User Experience (UX). A breadcrumb trail is displayed just below the main menu, for instance as this page is a blog, the path is iAdControl Blog › The Importance of Information Architecture. In addition, the menu tab is highlighted, which provide a quick visual aid to indicate the user's location as well. Having information oriented website means it really needs to be organised and consistent throughout and valuable to the user. Without good user experience, no amount of optimisation will help your website’s rankings. 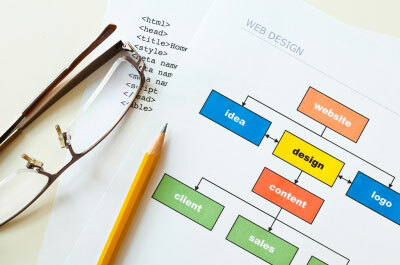 Understanding how people search online is the first task to developing good web design and meaningful website structure. Cleary define the purpose of the information on every page and hint affordances where possible. You should always consider the classification carefully and you can go as far as reviewing it meticulously. When searching online, the user wants content that’s easy, quick to find and in small chunks. Having an excessive amount of scattered and loosely connected information causes the website to shed its core message. Accommodating your users may be the number one goal of your current website’s content. For it to operate to your highest advantage, it has to be setup in a way that doesn’t hinder the user or the search engine’s ability to crawl your website.